Spring cleaning. It’s something that I often think should get done, but keeps getting pushed aside for more interesting activities like planting flowers in the garden or getting outside with a can of spray paint. Occasionally, however, there’s an area of the house that’s just so far gone, it can’t be neglected anymore. Two years ago, that was our garage. It had always been a bit of a disaster. We never really put much thought into organizing things when we first moved in. 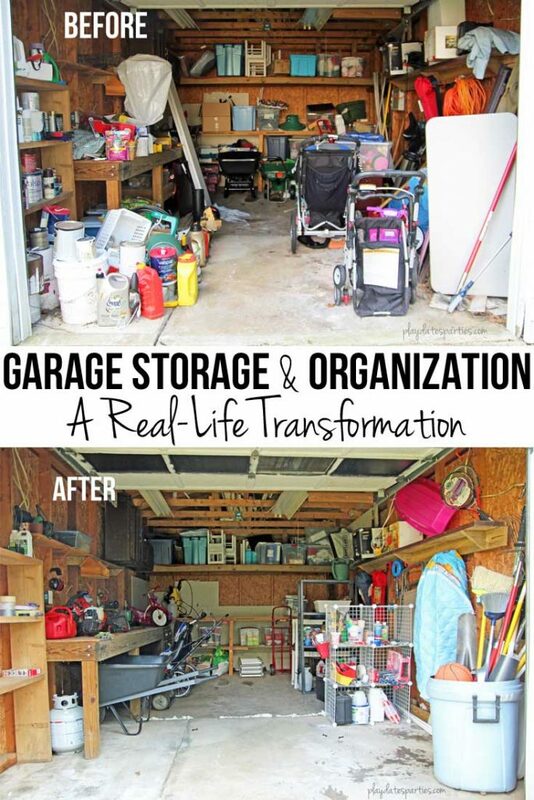 Add all the kid stuff (bikes, wagons, etc) that accumulated after a few years and it was plain frightening. Even worse was that it had become infested with mice and was a favorite spot for snakes to come in and hang out as well. Disclaimer: it’s a detached garage that backs to woods that are shared with a local farm. Critters like that are unavoidable in the area and have not been a problem in our actual home. The first step was to take everything out, clean up all the droppings (shudder) and seal any crack or crevice where rodents could enter. 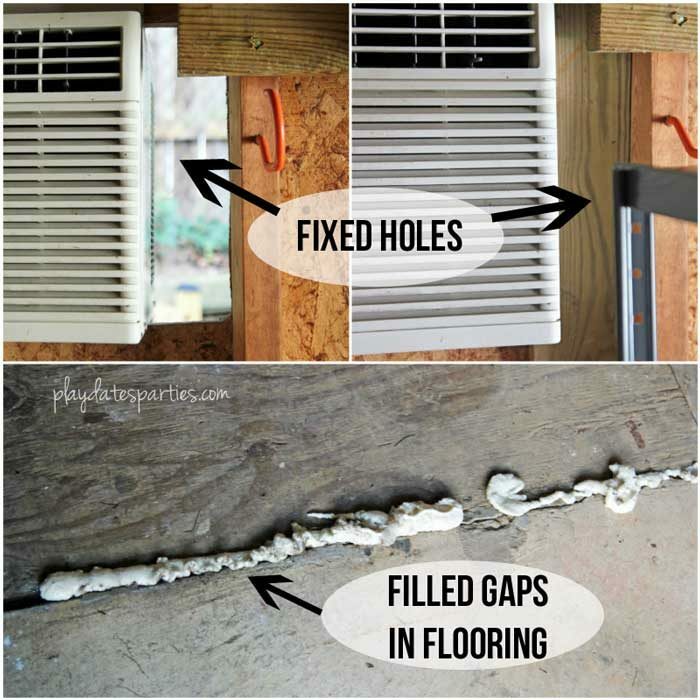 We found a large crack in the flooring, where we assumed most of the mice were entering, and patched up a giant hole next to the air conditioning unit left from the previous home owners. As we removed items, they were sorted into piles of “keep” and “discard”. Because of the mouse infestation, we didn’t risk trying to sell or donate anything. We discarded at least three very full carloads of junk that day. 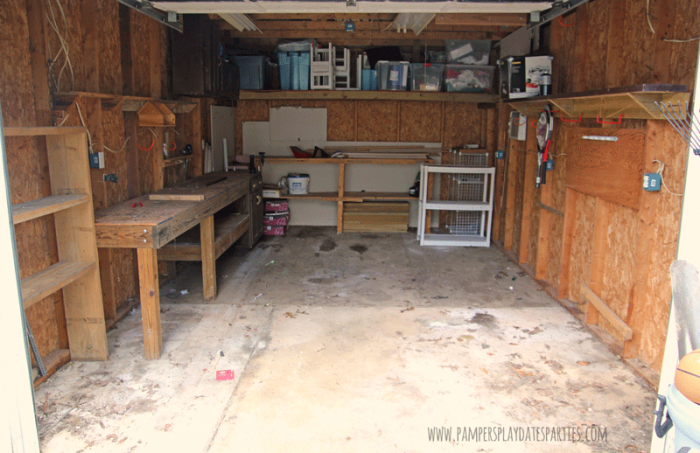 Since our garage is purely for storage (the rear is on stilts that wouldn’t support a car), I started to see the space differently. Instead of trying to clear up as much floor space as possible, I tried to think of the best way to use it and came up with what I call a “retail concept” for organization. 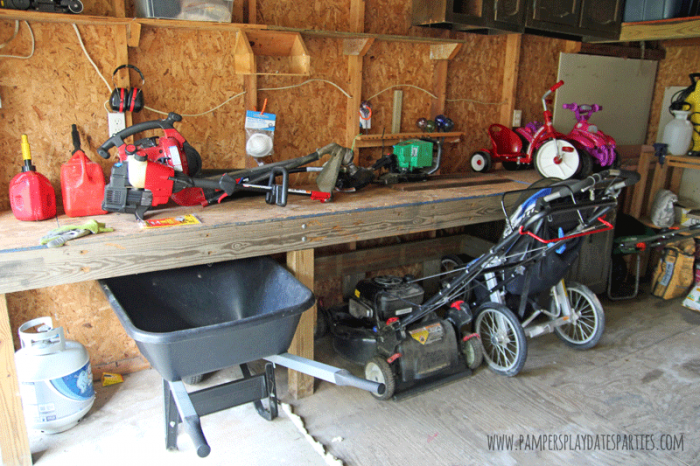 Along the left side of the garage, the area under the workbench is used to “park” all of our wheel-bearing items like the lawnmower, wagon and wheel barrow. This way, the husband wouldn’t have to dig all the way to the back of the garage just to mow the lawn. Gasoline powered hand tools were stored on the top of the work bench since we don’t really use the bench for home projects. 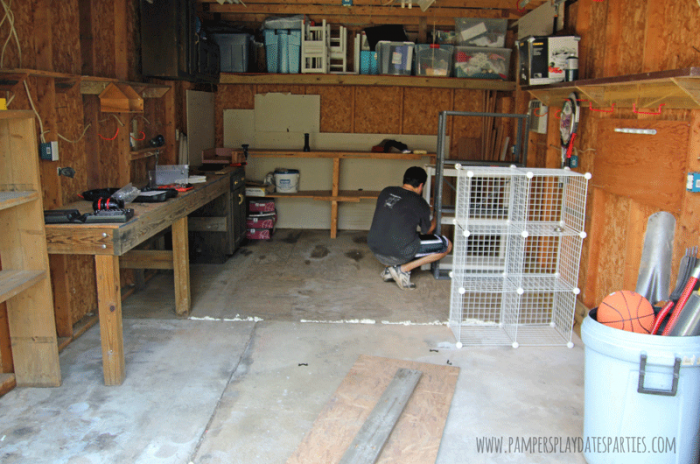 Along the right side of the garage, we set up all of our bookshelves and organizing racks perpendicular to the wall. We left space between each rack to create “aisles” for easy access to small items. 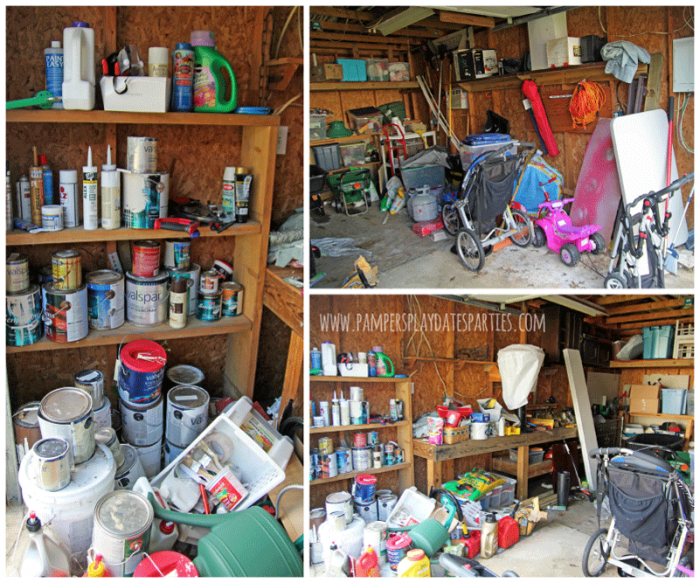 Each set of shelves is a “department”, like paint or gardening supplies. 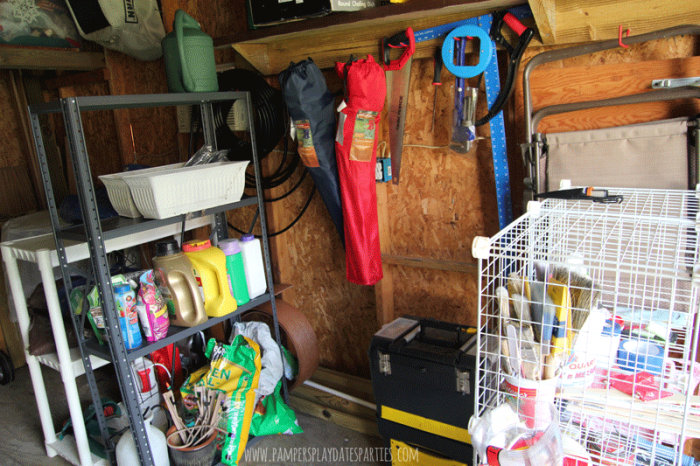 Long-handled tools and sports balls are in an old rubber trash can at the front of the garage for quick access. 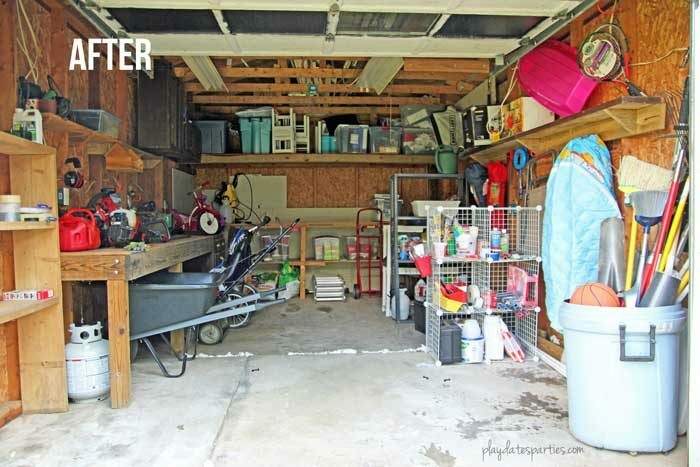 All large items and long-term storage items are kept on the built-in shelving in the back of the garage. 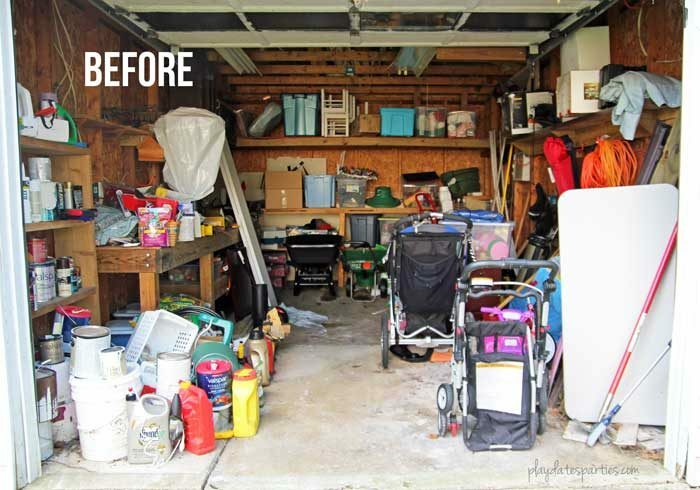 The best thing about this arrangement is that it left enough space toward the front of the garage for small to medium sized projects but also left a good walkway to get to everything we need while maximizing the garage’s floor space. To top it all off, we did the whole project in one day and with NO MONEY. It may not look like something on a magazine cover, but I can honestly say that it functions well. Two years later, the shelves are a bit messier, and the rubber trash can is finally worn out and needs replacing. But we haven’t had any problems with infestation since then, and we still don’t need to dig through piles of junk to get to what we need. Have you done any spring cleaning this year? 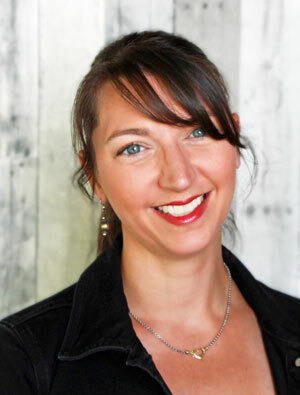 Do you have any organization projects you’re avoiding?